4 Bedroom Detached House For Sale in Woking, Surrey for Guide Price £1,750,000. A charming Grade 2 Listed house, well-appointed and decorated to a high standard, offering a blend of period detail and contemporary living. Approached through electric gates and gravelled driveway, this property has a wonderful ambience from its beamed ceilings and internal decor to the delightful park like gardens of approximately 1.33 acres. Incorporating an enclosed heated swimming pool and changing rooms, a floodlit tennis court and a 3 car garage with a two floor maisonette over with vaulted ceilings. The combination of accommodation, leisure facilities and ancillary living space is usually only seen on more expensive properties and I would urge you to seek an early viewing. These types of property do not come up that often and if I was looking to buy a property of this nature, it would be my first port of call. 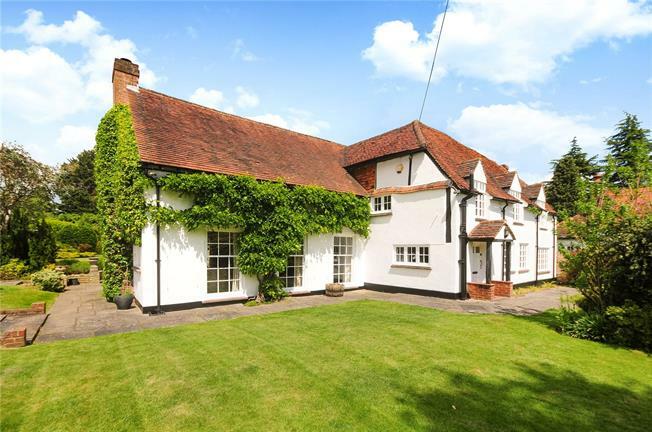 The property can be found just to the West of Chobham village, one of the most popular villages in Surrey. At the centre of the High Street is St Lawrence Church with its very fine Medieval tower. There is a good selection of local shops, some excellent restaurants and The Sun pub is a favourite with the locals. More extensive shopping centres can be found in Guildford and in Woking, which is about 5 miles away, where there is also a major rail station with very regular and fast links to London Waterloo (around 25 minutes). Woking also offers a leisure centre, swimming pool and theatre. The village also has an excellent rugby club with a large and flourishing junior section and a thriving tennis club. There are a number of leisure centres and health clubs in the general area and Chobham golf club is just a few miles away. Sunningdale, Wentworth, Foxhills and Queenswood Golf clubs are also nearby. Ascot racecourse is about 7 miles away and is known throughout the world for it’s Royal Meeting in June and anyone with an equestrian interest will be pleased to know that there are a number of local stables from which you can ride out onto Chobham Common, you could even try your hand at polo with Ascot Park Polo Club being just the other side of the village. The gardens offer a delightful backdrop to the main house. Predominantly laid to lawn and interspersed by mature trees and bushes, this is an ideal playground for the family. To the front is a sweeping gravelled driveway flanked by lawns and a pathway to the front door whilst the front boundary is walled with electric entrance gates. In all, the gardens extend to 1.33 acres and for you to appreciate the benefit of the grounds and this Grade 11 Listed gem, you will need to make an early viewing.